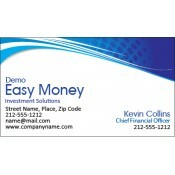 Finance business card magnets are affordable promotional items for investment services that are trying to put their contact information on an easy-to-find location, the refrigerator doors. 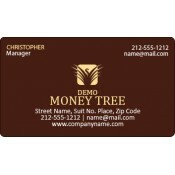 Financial services and professionals can easily imprint their contact information on any of these magnetic business cards. Save on ground UPS shipping anywhere within the contiguous USA. 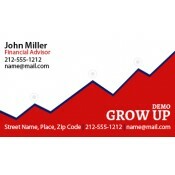 Avail attractive wholesale discounts on bulk ordering these promotional magnetic business cards. Every financial service or professional, irrespective of their business size, will try to impress their client by giving logo printed business cards because they are budget-friendly. People may misplace these business cards easily because it is lightweight or they may stack them inside their drawers. 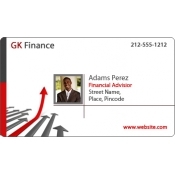 This realization is driving financial services and professionals to seek customfinance business card refrigerator magnets for value building. Most financial services thrive on local clients which means they need to establish close connections locally. Financial services can order these promotional magnetic business cards for tradeshows, corporate events, business conventions and more. Being lightweight, these promotional magnets are also perfect for bulk mailing. 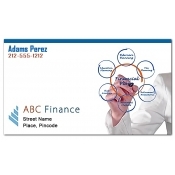 Financial services or professionals who are keen to invest in magnet advertising can combine these best-selling business card magnets with other promotional finance magnets from our collection. As there is no good or bad time for handing out a business card, similarly, there is no typical time for giving these magnetic promotional magnets. Business cards are the most affordable promotional tools which mean financial services can easily afford our customized business card magnets, too. They can order it in bulk for long-term use at extremely low prices. 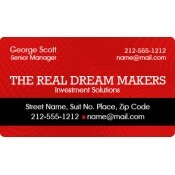 We offer the highest wholesale discounts than any other online store selling custom magnets. In addition, we support smaller businesses by offering tailored price advantages for their orders. We offer free full-color printing which means marketers can go lavish with their choice of colors when printing these promotional magnets. They can avail free art setup, free online design proof and lowest price match guarantee on all orders. If you already possess a business card and wish to add a magnet to it, we can do it easily without any additional charges. We accept artwork in specified formats at art@cmagnets.com or you can upload it at the end of the express check out page. To know more about discounts, color imprints, tailored pricing, shipping and other details, feel free to contact us at 855-762-4638 or write to us at info@cmagnets.com.